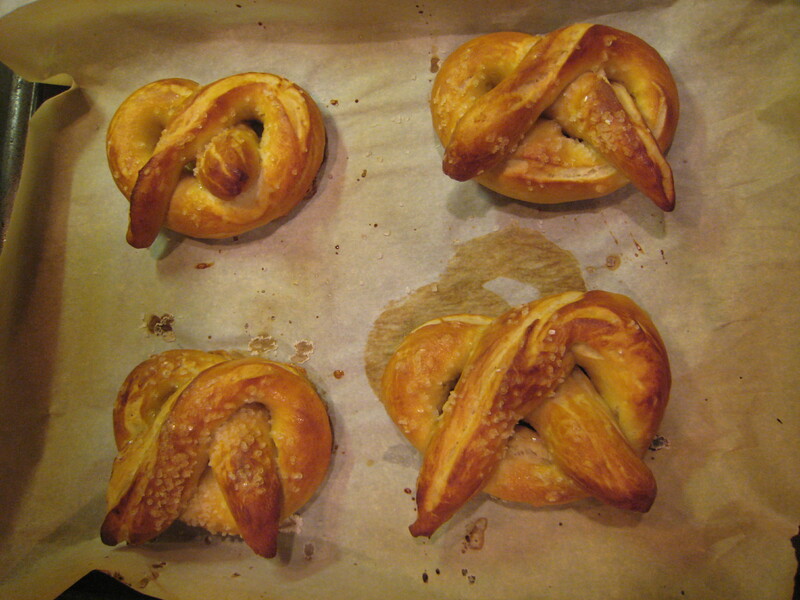 The Fearless Cooking Club’s Adventure into Oktoberfest ends with the pretzel: soft, homemade, chewy and great with mustard and beer! 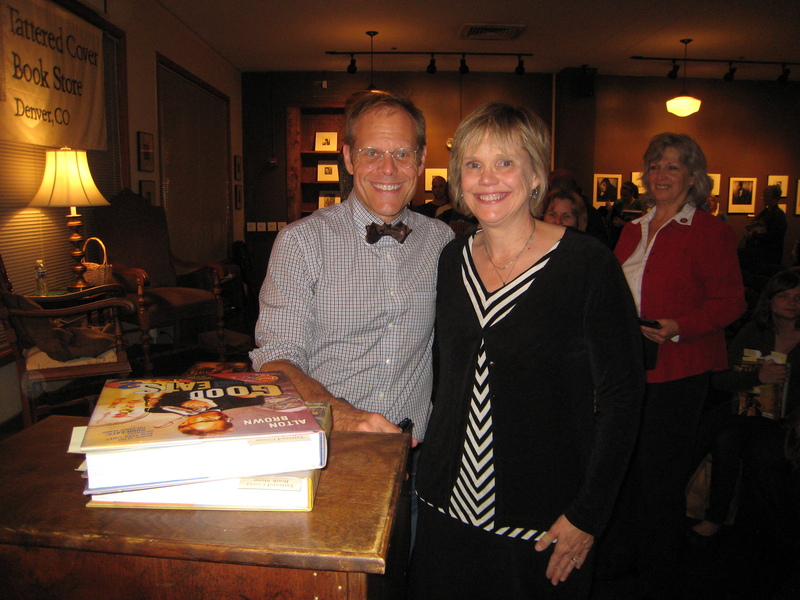 This author had the privilege to meet Alton Brown at a book signing several weeks ago and this recipe came from his new book Good Eats 3. He spoke to a crowd of 250 people for thirty minutes and signed books and posed for pictures for two hours. Very gracious! My family loves soft pretzels so they were excited to see these roll out. I was intimidated because the recipe in the book didn’t give me the full picture of putting it together. So I watched the Good Eats Pretzel Logic Yeasts on YouTube. It helped quite a bit to visualize the entire process. The sock puppets posing as fungi were LOL entertaining as well. 1) Rolling the pretzels took some practice. The book and video indicated to wear gloves on an oiled surface. That didn’t work for me. I oiled the dough after the rising process but rolled it on a dry cutting board. 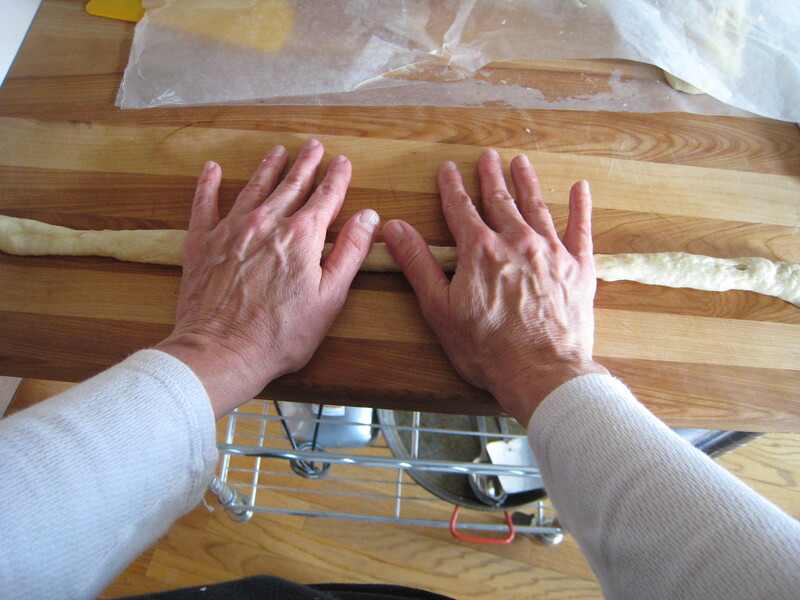 2) The dough was divided into eight parts. 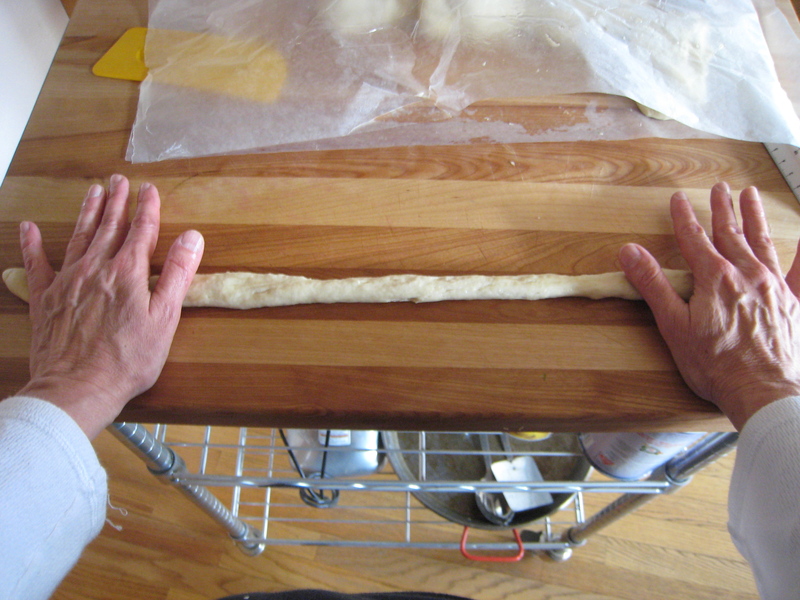 Each portion of dough was rolled from the inside outward to 24 inches in length. 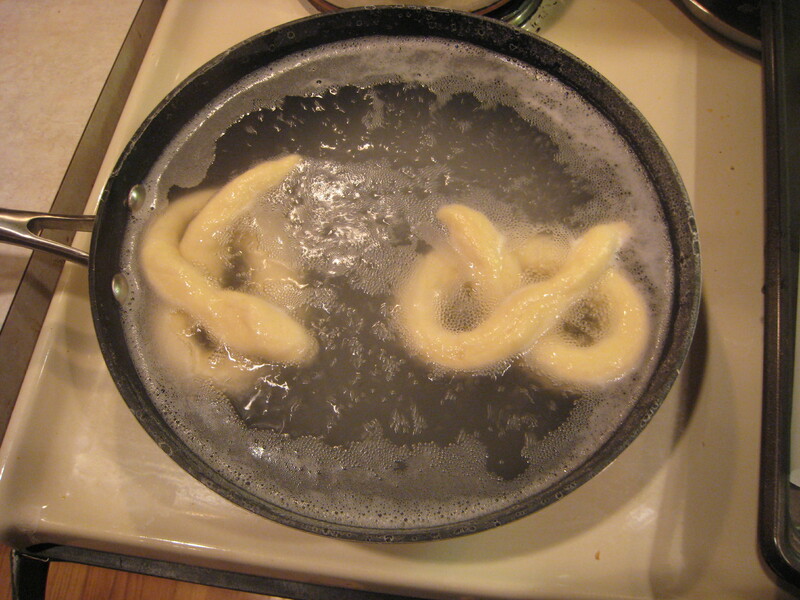 3) The pretzels were formed into a “U” shape, then folded over like arms crossing. 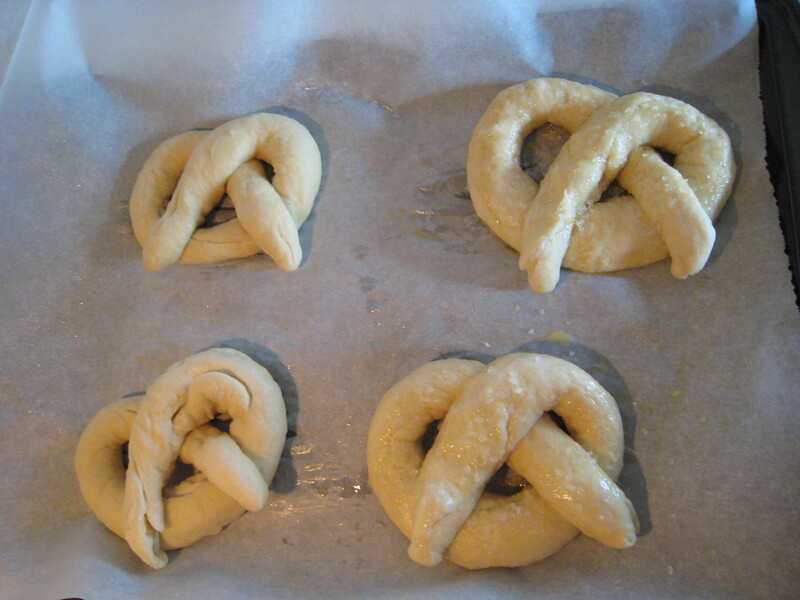 4) The pretzel dough was boiled for 30 seconds in a water and baking soda bath. The mixture provided a positive ion ph base, coating the dough to enable the browning process when baked. 5) Scooped from the water and back onto the parchment-lined baking sheet, they were brushed with an egg wash and sprinkled with a coarse salt. Baked to a golden brown for 16 minutes at 450 degrees. I also made homemade mustard to go with the pretzels. 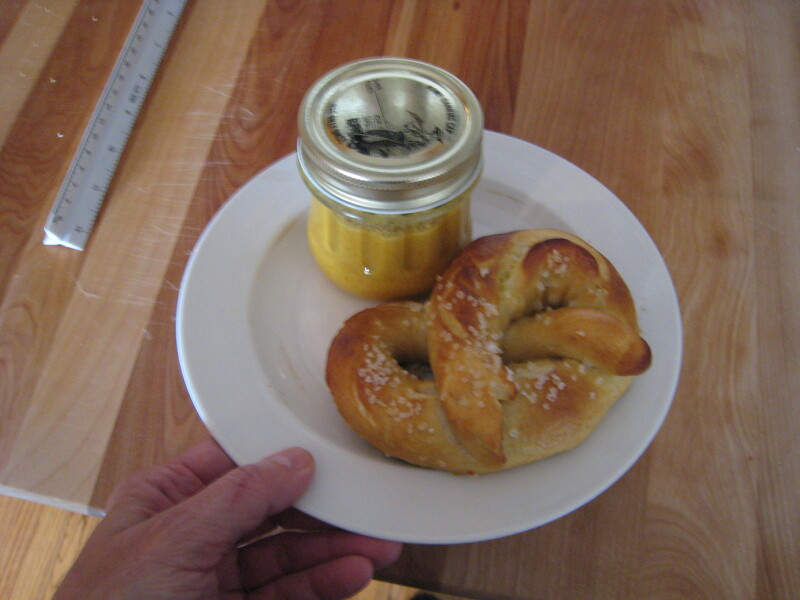 The homemade mustard is in the Part 2 of Good Eats Pretzel Logic Yeasts episode. The Fearless Cooking Club met today to eat the bratwurst, sauerkraut, pretzels and homemade mustard. It is hard to believe that this was a seven week process of food preparation! On my next entry I will post that celebration and report on the sauerkraut, sausage tasting and member updates. Cheers to the end of Oktoberfest! 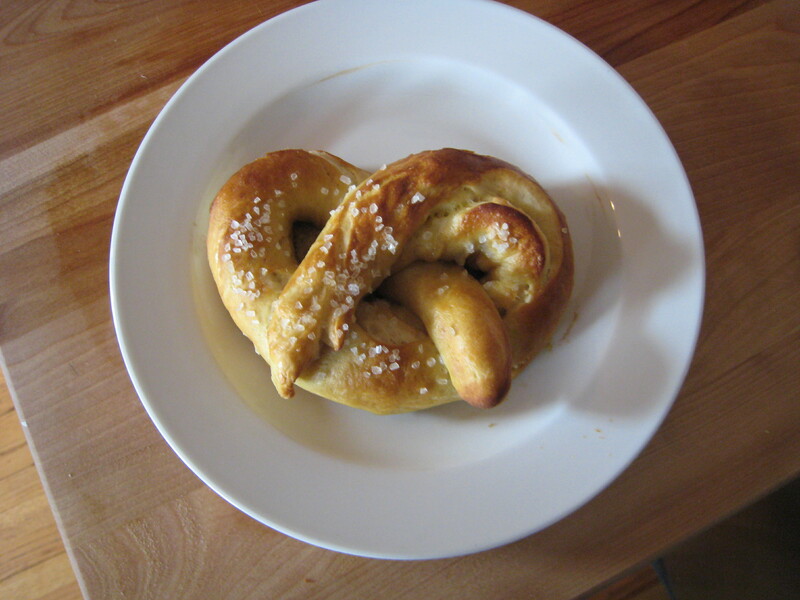 This entry was posted in bread, cooking, Cooking Clubs, Food, German food, Oktoberfest, Pretzels, Uncategorized and tagged bread, cooking, cooking clubs, food, German food, Germany, mustard, Oktoberfest, pretzels. Bookmark the permalink. These look amazing. I need to give it a try. Thank you for the step-by-step photos it makes it easier to know what to do. How awesome to meet AB! And I will have to put these pretzels on my to-do list. Those pretzels look so yummy! I think it’s amazing all the stuff you tackle cooking for your blog posts. My culinary skills lurk around chicken nuggets and italian sausage (store bought, of course) with noodles. Thank you for sharing! I will subscribe to your blog for sure. AB gave a funny presentation. He definitely has some crazy fans out there and a few of them showed up at the book signing!!!! The nice thing about soft pretzels is that few people hate them, unless you have a gluten allergy. I give myself at least one day a week to cook and make a horrible mess in the kitchen. The rest of the week is less dramatic with easy to prepare dishes. Yum! My son actually wanted to make pretzels this weekend! You just motivated me to go for it! Thanks for stopping in and checking out my post. Good luck with the pretzels. They are meaty pretzels. My second batch is in the freezer to use when family comes home at Thanksgiving for snacks.